A new Quilt-a-long caught my eye over on Flickr. It's being organised by Angela Fussy Cut and Amanda Msmcporkchop and photos are being shared in the Flickr group here. 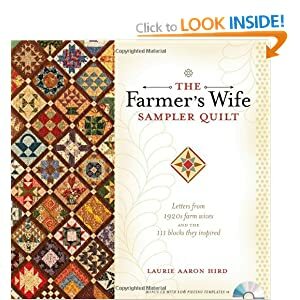 It is called the Farmer's Wife Quilt-a-long and is based on the quilt in this book which you need to buy to join in. Mine is ordered and it on its way. The quilt is made up of 111 blocks and the plan is to tackle two per week. My plan (copied from Amanda's approach) is just to make each block from whatever fabrics I fancy at that point in time with no long term plan as to how the quilt will come out and hope that the sashing will pull the whole thing together. I made four block yesterday which I liked and one which I didn't like so much but will probably find a place somewhere in the quilt anyway. The four are in the mosaic and the one is sitting all along at the moment, in the "fail" corner but will probably join its friends in the main quilt at some point. I'd love to know which blocks you like more and think work better and why as part of my whole process of learning more about combining fabrics. I would say that, at the moment, the set looks boring and too uniform so I am going to need to mix it up a bit to make the quilt more interesting but I have over 100 blocks to achieve that so I'm not worried yet. holy crap! another 'must do' on my list of never ending things, but it's called framer's wife for goodness sake, i have to get that book! I like top right and bottom left best. Looks like a fun project, looking forward to seeing more of your blocks as you do them. I do like the blocks on point and as the whole quilt will be like that, mmm yum! Is the end quilt like the cover? wow that will be amazing. I sneaked a look at the book, very wholesome! I love the purple block and can see so many possibilities just using that in a quilt with some interesting fabrics. Actually, I like all the blocks and they all offer up inspiration of how they could be used in mulitples. I'm with Scissors and Thread. I prefer Top R and Bottom L as those blocks have more contrast in the fabric and are easier to 'read'. Next would be Bottom R and my eye finds Top L most confusing but this one will probably work well in the quilt as you don't want everything to be obvious in the overall picture. Love all this experimentation Lynne! Keep going - I'm learning too! I love these blocks and the modern spin you are putting on the originals by using these fabrics. My thoughts are that this could be one of those quilts you just have to make before you can really get a feel for which fabrics work best. Right now, with just four, the balance may not seem right but once you've made ALL the blocks you may find they are perfect. Thank you for bringing this amazing book to my attention. Looking forward to seeing your progress. You are inspiring! The only one I don't like is the one in the top right corner of the mosaic probably because the darker fabric in this block design is quite domineering and my favorite is the one in the bottom left corner. I saw the QAL a few days ago too but can't commit to two blocks a week at the moment. But I will buy the book and go at my own pace. 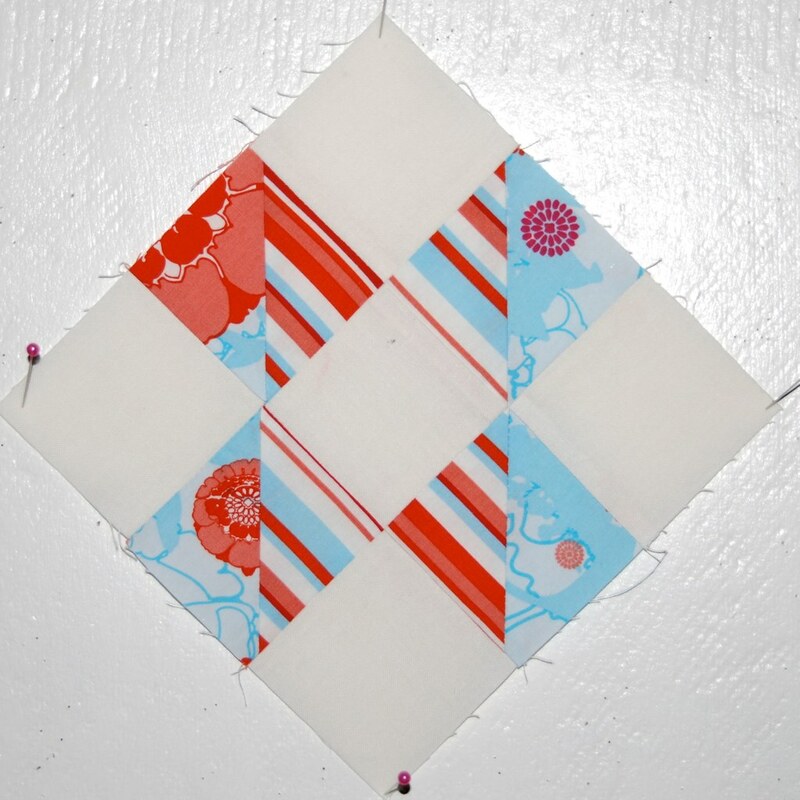 This pattern and the 'Dear Jane' are on my list of top quilt patterns that I must do. In terms of fabric choice I don't think this set looks boring at all. I personally would try to stick to one colour palette but I would make it a wide palette. Sheesh Lily, nothing you do is boring. I keep seeing the Farmers wife, but hmm I don't know if I'm going to do it. I ordered the book and I'm waiting on its arrival. I completely can't decide whether to stick to a colour scheme (I am having a yellow addiction at the moment. Maybe yellow/grey/aqua or something) or just go scrappy (which would be cheaper, as I have bazillions of scraps). Looking forward to seeing blocks in the flickr group to help me decide though! I agree with Kirsty that it's too early to know which blocks work well because you don't have enough yet. However, I think that one in the time-out corner might not work as well for this reason: The outer fabric scale is not consistent. Only upon more careful inspection does one recognize that the top left triangle is really from the same fabric as the other outer triangles. It's kind of like fussy cutting with the scraps. It might be helpful if the same parts of the fabric design were used in all of those outer triangles. That being said, I really like the colors and the stripes with the floral and of course, the white offers great contrast. I will follow Scissors and Threads: the top right and the botton left! And I will look inside this book right now! !And once again, you are inspiring all of us! Thanks! I wanted to do this,but I am doing another quilt along at the moment:) maybe,JUST maybe-he,he! Uh-oh. I own that book and have used it for 2 projects - a red/white USA block quilt and a blue/white history quilt for my mom. Since neither are finished, perhaps I should join the quilt along. If you're doing over 100 blocks in whatever fabric you fancy at the time, I don't think you have to worry about it looking boring or too uniform! Looks like fun. This looks like a great quilt project - how big are the blocks? I am interested in seeing you give it your modern twist with your fabric choices and agree it's early days to be rejecting any blocks.It reminds me of a project I started last year - "Victory Quilts" by Eleanor Burns, made a few blocks, also to be on point but time has passed and I am bored with the fabrics, but maybe I should re-visit with new favourites. I love the stories behind the blocks don't you? I have been charmed by this QAL too and have ordered the book. I like how the modern fabrics work with these more traditional blocks and think it will be fun to make some too. Of your blocks, I like the pinwheel like one in the bottom left the best, mainly because of its shape. I like all your blocks though and these are very wonderful fabrics. i also have the book, all of that series are really good! doing a mixed version of all sorts of fabrics and loving it, just what i love doing. playing with fabric!!! I'm joining in too and, like you, I'm following Amanda's approach. One suggestion for you to start mixing things up is to venture away from white as your background fabric -- maybe other solids (both light & dark) and perhaps (gasp!) some small-scale prints? I'm loving ALL of your blocks -- even the "black sheep"!! People are drawn to pretty fabrics, and by pretty I mean multicolor prints. I love them, and I have far too many of them. The problem is, when you cut them up and sew them together into more complicated blocks, you often lose both the pretty fabric AND the complicated piecing. Your top left block is a great example of losing the piecing - the colors are beautiful, but because the prints all sort of blend together, we can't fully appreciate the piecing. As your blocks get more complicated you'll want to be able to see the pieces clearly so you can appreciate the work that went into it. When you have blocks like this, consider incorporating fabrics that are a single color - not necessarily solid, but a single color print. They're not as fun to buy, but they give you the ability to showcase both your piecing and the other fabrics in the block. Your extra block shows how you can lose the fabric. While you fussy cut the fabric in the top block, in this one it looks like completely different fabric because of where the print fell when you cut it. As for the other three blocks, I think they're wonderful. Top right is darker, but value changes are important and if you use those and other darker fabrics it will give your quilt the depth that I think you're looking for. The two on the bottom use multicolor prints, but they don't hide the piecing. I noticed that four of the five blocks have a white background. 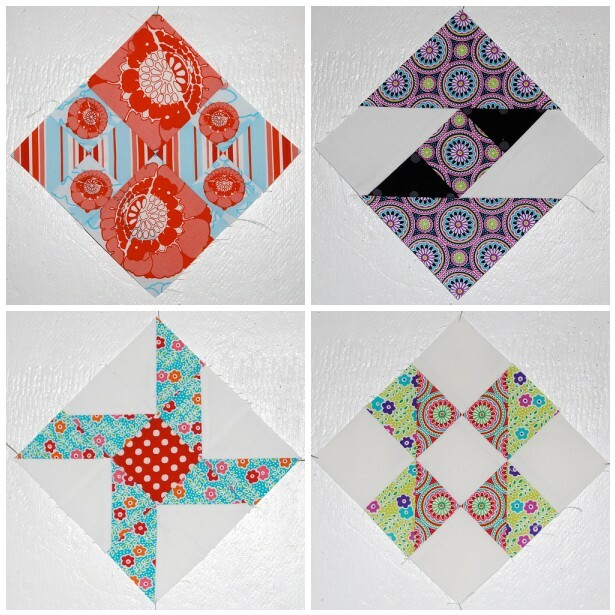 Think about the overall quilt - do you want all of the blocks to have a uniform background, do you want them to be a combination of white and print backgrounds, or do you want them to have a variety of different color and print backgrounds? All would be beautiful, but you want to think this through at the beginning so you don't end up with just a few blocks that look awkward with the rest of them. I want to ditto what piecemealquilts said. The purple block is really special. I like all the blocks! I'd love to join in but it looks a bit daunting for me, so many blocks! I dont think I'd have enough patience, I always want something finished as soon as I've started... But I'll certainly enjoy following you do it! this seems like to big of a project to undertake for me right now. But I have been seeing the buzz about it on different blogs, Angela's included. Good luck, I'll be watching. Hey! I belong to a yahoo group for The Farmers Wife and am way behind. I joined your flicker group. Hopefully I can make myself start sewing again. I really need to stop reading your blog--I keep running into new must-do projects! I would love to do this but can`t get access to the book quickly enough. I seem to be in the minority here but I love top left but then I like eclectic designs and mixes of colours. Whatever you come up with it will be wonderful! By the way, is that the lonely block at the bottom? Why am I feeling sorry for a block of fabric?? I'm into pinwheels lately, so I really like that square. I am not an addict. I can quit any time I want. I've got the book, it's a real hit here(, too). But I absolutely HATE those yukkie colours: What would your kids say? More colour, yes love that. Is it a Red Pepper-rule to always use white as a background? I totally agree with John: more colour, softer yes, but white, NO. I mean if you intend to use your throw or quilt, don't use (so much) white. Marti Michell has made a template conversion for all the blocks, which might be easier too. Thanks @piecemealquilts for the omissions in the book: I didn't know that. I'd love to take part, because I love your choice of fabric so far. A bit out of my comfort zone, so a great thing for me to learn about fabric. I only have to finish one big quilt, then one for my eldest daughter, and there's a small project lying around (somewhere?). But I'm sure I can switch between projects, as I have done so far! These are gorgeous, all of them, Mme. Over-Achiever. I think with 100 blocks you can go for the anything and everything approach with fabric choices. You have a great eye for colour so they will all come together! i've been sucked into the vortex of these awesome blocks and equally awesome ladies making them....another QAL, here i come. I just love your blocks. Love the colors especially the turquoise and reds together. You are a total inspiration.